Isn’t wonderful to be able to attract the wild birds to your garden and help them out with extra food and a place to nest during a harsh winter? Unfortunately, when you put out food for the birds, word gets around the neighbourhood and before you know it, you have other wild critters coming to dine as well. One of the peskiest, and cutest, of these is the squirrel. 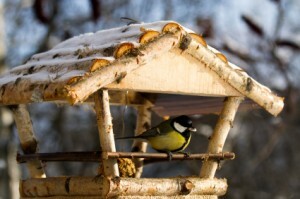 Here are some ideas on how to build a birdhouse that keeps squirrels out. Squirrels can be really fun to watch in your garden but when they eat more than their fair share of the food you’ve carefully put out for the birds, they tend to over-stay their welcome. They are extremely clever, agile and crafty creatures and can find ways to get around many of the squirrel-proof gadgets on the market today, in order to get an easy feed. Unfortunately, it’s not only the birdseed you’ve put out that they eat; they will also raid the nests in your birdhouse and eat the eggs and even young baby birds. This is why you need to know how to build a safe haven for the birds that the squirrels can’t access. There are lots of designs and patterns with instructions for building a birdhouse available online, many of them free. The actual design is not the important factor in making it squirrel-proof, it’s how well you limit the access to it and into it that matters the most. So find a design that appeals to you, that is within your skill range and complements your home and garden and go ahead and construct it. Then you can apply any of the following ideas to ensure that your bird inhabitants and their food are safe. Squirrels will nibble away on wood to make the hole in a birdhouse big enough to squeeze through, so either make your birdhouse out of metal or reinforce the hole or doorway with sheet metal to prevent this happening. Another method is to cover the hole with poultry netting that will allow small birds to get through but not larger birds or animals like raccoons and squirrels. Make sure the metal or netting covers an area several inches bigger than the hole to be most effective. Another method that some people find effective is to make a poultry netting ‘cage’ to fit completely around their birdhouse, to enclose it and keep out larger predators. The netting will need to be 1 1/2 to 2 inch gauge to allow little birds through and make sure there is enough room between it and the birdhouse for the birds to move around. Vinyl-coated wire is especially effective against squirrels because they have trouble gripping it if they have jumped onto the cage from a tree or building. Where you place your birdhouse is another important factor in keeping squirrels out. Squirrels can climb up trees, buildings and onto rooftops to jump onto the birdhouse or feeder, so make sure there is at least a ten to twelve foot clearance in all directions to prevent this. To further foil squirrel feeding attempts, fit a baffle to the pole holding the birdhouse. This is an umbrella-shaped structure made from plastic or metal and eighteen inches to two foot across; it fits beneath the feeder or house, at least six feet from the ground. The squirrel climbs the post, gets caught under the dome of the baffle and can’t get up to the birdhouse. The theory is that he then gives up but I suspect he goes away to plan a different approach! You can buy these baffles or make one yourself out of a plastic bucket, a piece of sheet metal or firm plastic. If the baffle wobbles around on the pole a bit, that’s all the better. If a squirrel jumps onto it from above, he will simply slide off. Another type of baffle can be made using a piece of PVC or stove-pipe, with a cap fitted on one end. Make a hole in the middle of the cap and slide onto the pole which will hold the birdhouse, so that the base of the pipe is about six feet off the ground. Attach a hose clamp under where the base will sit to hold it all in place. The surface of the pipe is slippery so squirrels won’t be able to climb over it from the ground. A clever way to thwart those pesky squirrels is to suspend the birdhouse or feeder from a sturdy wire that has been strung between two strong trees or a tree and a building. These must be at least eight feet apart but more is better. Close to where the wire is attached to the supports, string three empty large soda bottles, which have had a small hole made in the base. When the squirrels try to walk the wire to get to the birdhouse, the bottles will twist and turn, tossing the animal off. Of course, if all else fails, accommodate the squirrels’ need for food. Set up a squirrel feeding station in another part of the garden, well away from your birdhouse. Squirrels love peanuts and especially peanut butter but are also partial to corn, dry bread, cut up fruit and raisins, so put out a dish containing these foods and they should leave the birdhouse alone. You can make a simple corn feeder by joining two pieces of wood, each measuring approximately four by six inches, to form a right angle. Towards the edge of one piece, drive a long nail in from underneath to stick a cob of corn on. Attach to a tree and sit back and enjoy the squirrels and the birds. There will be something here that will help you with keeping squirrels out of you birdhouse or feeder, so that you can enjoy the wild birds that choose to visit your garden. Oh I haven’t yet seen squirrels in my whole life! But I really love the movie chipmunks it seems that they look so cute and adorable. That is funny. I have grown up with squirrels. Interesting how they are only in certain climates. I have squirrels all around my house.They’re a real pain. But this sounds like a project I wouldntmind doing on a weekend. We don’t have too many squirrels here in SF but there are a lot in the suburbs and where I grew up. They are funny animals and will try to squeeze their way into anything! Birds are funny too. One bird at my mom’s house turned her mailbox into a nest a few times.